WARNING: In The Wonder Weeks, full version, all ten leaps are described. This chapter book only describes the first leap. The Wonder Weeks Fussy and Wonder Week 5, Leap 1. 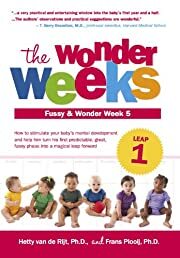 How to stimulate your baby's mental development and help him turn this predictable, great, fussy phases into a magical leap forward, describes in easy-to-understand terms the incredible developmental changes that all babies go through 5 weeks after the due date. The book is based on the discovery of the phenomenon that all normal, healthy babies appear to be more tearful, troublesome, demanding and clingy at very nearly the same ages. A worldwide bestseller and sanity savior for parents around the globe. Everything indicates that during this leap your baby is experiencing a rapid maturation of metabolism, internal organs and senses. S/he is clearly more interested in the world around him and is now better able to look at things beyond the range of 20-to-30 cm. As a parent you notice that your baby suddenly is responding more to you and others. Interesting note: your baby produces, for the first time or much more frequently than before, tears while crying. Did you know… Just before your baby makes this leap, there is a dramatic increase in the circumference of his/her head. The glucose metabolism in his brain also changes. So a lot is happening in his little brain. You can really call this a major leap!